You are buying a Custom iPod classic 7th generation 256gb (only). Red, grey, black, silver or gold with a Red Wheel. All new parts, tested works great. It is a complete iPod with No accessories. 256gb msata. You are buying a Custom U2 iPod classic 7th generation 1TB / 1024gb (only). You now have 5 colors to choose from, with a Red Wheel. All new parts, tested works great. It is a complete iPod with No accessories. You are buying a Custom iPod classic 7th generation 400gb (only). Grey,Black,Gold ,Red or Silver with a Red Wheel. All new parts, tested works great. It is a complete iPod with No accessories. Battery 3000Mah. This is an iPod Classic 7th generation Gold with a 160 GB HD. This iPod is in perfect working condition internally and is good looking. You are buying a Custom iPod classic 7th generation 800gb (iPod only). Colors are Red, Gold, Black, Gray or Silver with a Red Wheel. All new parts, tested works great. It is a complete iPod with No accessories. This is an iPod Classic 7th generation Grey with a 160 GB HD. This iPod is in perfect working condition internally and is good looking. Custom U2 iPod Classic 7 Gen 256GB SSD and 1800mAh battery - 90 days warranty!!! This iPod as been upgraded to a new hard drive SSD 256GB. Custom iPod Classic 7th Gen 256GB U2 iPods! All new parts! 1x Custom U2 iPod classic 7th SSD 256GB. New battery (1800mAh). And the back cover is Black and Red U2 Special Edition ，. Apple iPod classic 7th Gen Black and Gold (120 GB) excellent condition + extras! Apple iPod classic 7th Gen Black and Gold (160 GB) Excellent Condition + Extras! Apple iPod classic 7th Gen Gold (SSD128 GB) U2 Special Edition + extras! The iPod is in like new condition with no marks or scratches. 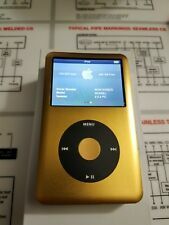 New GOLD 256GB Classic iPod Video (7th Generation). New 256GB U1 HIGH SPEED SD CARD~~~. ~~~ALSO I CAN FILL THIS WITH 256GB OF MUSIC UPON REQUEST!